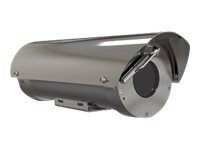 XF40-Q1765 Explosion Protected Fixed Network Camera features a 316L stainless steel housing certified for hazardous areas according to amongst others ATEX, IECEx, cLCus and Class I, II/Div 1 for OSHA. The cameras are designed not to cause an explosion. Their housings prevent any inside spark or explosion from escaping and igniting gases or dust in the surrounding air. The cameras can also be equipped with certified, explosion protected accessories, such as wall mounts, pole top brackets and a pressurized washer tank. They provide superb image quality and color fidelity, as well as a high level of flexible integration with other equipment, such as access control and fire alarms. They offer flexible remote accessibility, using any existing IP-based networks.